The Protector of Citizens Sаšа Јаnkоvić has received the meeting minutes and decisions of the Managing Board of the Clinical Centre in Niš by which they seek to rectify the irregularities in their work, established by the control of the Republic Protector of Citizens, but also to regulate other aspects of work of that important medical institution. In connection therewith, the Protector of Citizens would like to publicly express his satisfaction with the content of these decisions. Upon the complaints of citizens or at his/her own initiative, the Protector of Citizens applies a special procedure to check if there are or have been omissions in the work of public administration bodies. If such omissions are identified, the Protector of Citizens requires from the administration body to correct them and recommends an appropriate method. The administration body is obliged to inform the Protector of Citizens on its actions upon recommendation, and if no action has been done, the administration body must explain the reason for that. In addition to initiating and carrying out procedures, the Protector of Citizens is allowed to mediate, provide advice and opinions and urge administration bodies to improve their work and protect human rights and liberties. Thus the Protector of Citizens acts preventively (prevents future violation of rights) and educationally (educates citizens, but also staff of administration bodies, on human rights and their protection). 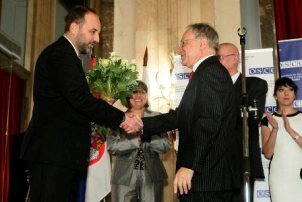 Too many people are still not able to exercise their rights, said Sasa Jankovic on the occasion of receiving the award "Person of the Year" for 2011 and expressed hope that the circle of citizens who are be able to exercise their rights will be wider every year. The Protector of Citizens is awarded for his commitment to protecting citizens’ rights and investigating maladministration by public authorities and institutions. A fully functioning democracy is not only based on the consent of citizens, but also on government accountability and the right to participate. The significant work carried out by your offices embodies these ideas, making a decisive contribution to the daily lives of Serbia’s citizens,” said Ambassador Dimitrios Kypreos, the Head of the OSCE Mission to Serbia. It is the moment to recognise our winners’ excellent service to the Serbian public and contribution in the fields of human and equality rights and participatory democracy,” added Ambassador Kypreos.